Live bait anglers know that having a good livewell on your boat is a priority. Different fishing boats have different livewells, and all are not created equally. For a live-bait angler, this can be huge. So, prior to actual on-the-water experience how can you tell if a livewell is going to make the grade? Look for these features, and you’ll know if that well is a winner, or a natural-born fish-killer. 1. 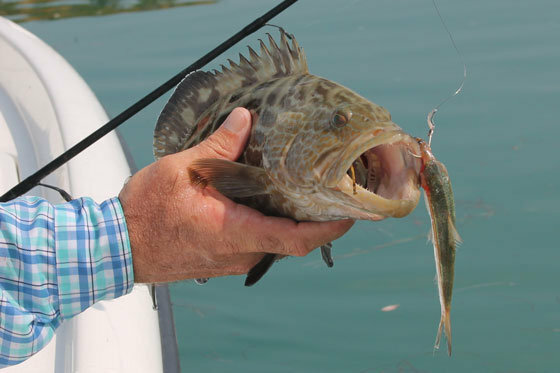 Volume of flow – The more water a well circulates, the better your baits will breath. Many minimal livewells are rigged with small 360-GPH bilge pumps for circulation, and these aren’t up to snuff. What’s worse is pump-share arrangements where one small pump feeds both the livewell and the raw water washdown. Look for large, dedicated pumps, and note that the best livewells have back-up pumps built right in. 2. Livewell shape – Oval and round are good, squared or any sharp corners are no good. Baitfish will swim into a corner and beat themselves to death, literally, against the fiberglass. 3. Overflow drains – Wells with overflows built into the side are the best, as opposed to livewells with stand-pipes. The problem with stand-pipes is two-fold: they get in the way when you’re trying to net bait, and they sometimes pop out, allowing the well to drain. This can be an unmitigated disaster, killing every last bait. If you’re forced into a well with a stand-pipe, at least look for those with threaded bases; these don’t come free as regularly. 4. Color – the best wells are baby-blue inside. Harsh white can agitate the baitfish, while blue helps to calm them. This isn’t just a rumor—a study by Mote Marine Laboratory proved it. 5. Top design – Good livewell lids have friction hinges so they stay up when you swing them up, gutters around the lip, and gaskets to prevent spill-out. The worst wells have lipped lids that don’t secure down. I’ve actually seen these cut live baits in half, when the boat bounced off a wave, sloshed out some water and fish, and the top slammed down on them. 6. Capacity – Simply put, more is better. And on boats with multiple wells consider overall capacity, not single capacity. Having it split is actually a good thing, since it allows you to keep multiple species segregated. It’s also advantageous because if a pump fails, you have a back-up livewell. 7. Full column inlets – Livewells with a series of full water-column inlets running down the side are superior to those with a single inlet. They mix the water better, keeping all areas of the well fully oxygenated.